A patch handle carrier is of continual gauge, but with an internally reinforced polythene patch around the handle, either glued or heat sealed. Usually finished with a straight cut punched out handle. A patch handle carrier bag can be printed up to 100% in full colour, and with extra spot colours (up to 8 colours in total subject to minimum quantities). available sizes: From 8"x12"+3" up to 26"x24"+5"
Lead times subject to location of manufacture, 4 to 12 weeks. All bags can be delivered under plain cover if required. Our Company assist in the creation of custom patch handle carrier bags. 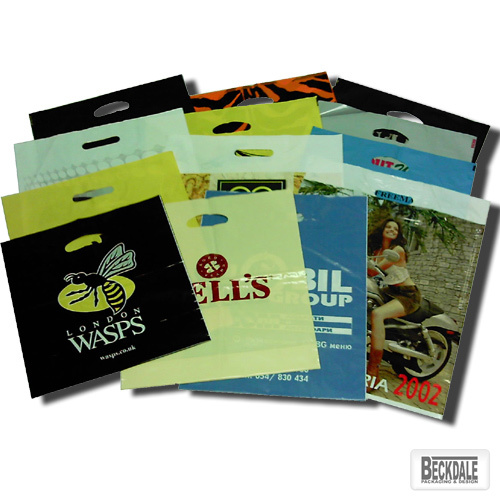 Our staff have the knowledge to help clients choose designer patch handle carrier bags. To start designing your choose by material or other , connect with our team using phone or email.